Well, when Sen. Dianne Feinstein’s office (D-CA) referred the Kavanaugh letter to the FBI, some were noting some Deep State aspects to this development—and it wasn’t conservative media. NBC reporter Jonathan Allen was on The Bill Press Show, where he said there isn’t much to discern from the development regarding if it could derail Judge Brett Kavanaugh’s Supreme Court nomination because there isn’t much to go on. At the time, the letter sender was anonymous, it was kept hidden for weeks, and we didn’t know what its contents were. “To President Trump’s point, I mean, there’s a deep state feel to this, right? Anonymous source to a senator through a House member, goes to the Justice Department…and no one sees what’s in it,” said Allen. He also adds that everyone in this town holds onto damaging information. It’s the nature of politics. He did say that if this nomination if going to go through, and so far it looks like it’s full steam ahead, then Allen noted that this move is not beneficial to Democrats by keeping this story in the headlines a week closer to the midterms, which could jack up the GOP base ahead of the midterms. Alas, Christine Blasey Ford is the woman who had lobbed the allegation of sexual misconduct against Kavanaugh. She sent the letter through Congresswoman Anna G. Eshoo’s office (D-CA) to Feinstein in late July, where the California Senator sat on it. It was not brought up during the frenetic and tedious two days of hearings before the Senate Judiciary Committee. She kept this letter in the dark and from her Senate colleagues. Then, it leaked. The story was out, and she referred the matter to the FBI. The allegation is that a drunken 17-year-old Kavanaugh tried to sexually assault Ford at a party. There are multiple problems with this allegation. It’s a classic he said, she said. It cannot be proven. It’s an incident that occurred almost 40 years ago. There are no corroborative witnesses, with some denying being at the party or not recollecting if there ever was a party. Judge Kavanaugh has denied it. He’s prepared to testify next Monday to these allegations, which Sen. Chuck Grassley (R-IA), has set aside to do so, postponing the committee vote on the nomination that was slated for Thursday. We now have 3 witnesses saying this party never occurred vs. the accuser (who has discrepancies in the few facts she has provided). Could this be why she doesn't want to testify? Ford is AWOL. She’s in the bunker. It’s likely that she won’t testify. Could it be that it’s because her story is full of holes? Maybe. Ford said she didn’t tell anyone of the alleged encounter until 2012 during marriage counseling, though she didn't name Kavanaugh by name, yet her husband says she used his last name during the session. And even there, the notes obtained from her therapist have discrepancies. It’s also been revealed that part of her story wasn’t true. She did tell someone days after the alleged incident, which made its rounds around school. Cristina King Miranda said this incident did happen, though she doesn’t know Ford personally and she doesn’t have a first-hand account, but asserts that this did happen. 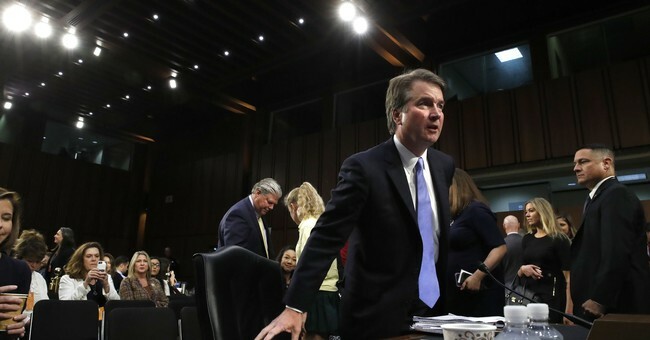 Mark Judge and Patrick J. Smyth, the two other people cited in Ford’s account, have denied witnessing any impropriety on behalf of Judge Kavanaugh. Also, as Ed noted, citing the original Washington Post piece in which Ford’s name was revealed, she can’t remember how this party came about, how she got there, or who owned the house. She retained a lawyer, Debra Katz, who is known for her anti-Trump disposition. Ford also subjected herself to a polygraph administered by an unknown former FBI agent. All of this may not reek of the deep state now, but it sure does seem like a politically motivated hit job. Ford was preparing to come forward regardless of this nonsensical notion that she wanted to remain hidden. Everyone she cited, as potential witnesses cannot corroborate her allegations. It’s shoddy. It’s pretty thin. And teenage antics shouldn’t be the sole disqualifying factor in blocking a judicial nomination, especially when the accusation lacks evidence. There’s just about as much evidence to prove this allegation, as there is with Russian collusion—zilch. To permit the Left to torpedo the nomination of an eminently qualified judge to the Supreme Court opens the door for future judicial and presidential nominees to possibly be torpedoed with spurious allegations that have no evidence. That’s a horrible precedent to set. The timing of this bombshell so close to zero hour is incredibly suspect. The politics of this cannot be ignored, and with regards to the principle of letting the accused have a forum to tell their stories, the Democrats, not the GOP, botched this. Everyone has torched Sen. Feinstein for how she’s handled this chapter of the process, which is now in chaos. On top of this drama, everyone will see this as a character assassination attempt, roped into a ploy to delay the confirmation vote until after the midterms. Well, Ford has until Monday to testify, then the Kavanaugh nomination is moving forward, with Sen. Jeff Flake (R-AZ), who said he backed delaying the committee vote due to this development, saying he would back his party’s push to get Kavanaugh through. The FBI cannot do anything. This is a political matter, not a one for law enforcement, which they’ve noted. There’s also no federal crime to investigate. Senate Republicans should move forward with the vote. Oh, and you know Feinstein said that she's not quite sure if the allegation is true, right? Yep, she did, before doing some damage control before the left wing mobs torched her again.